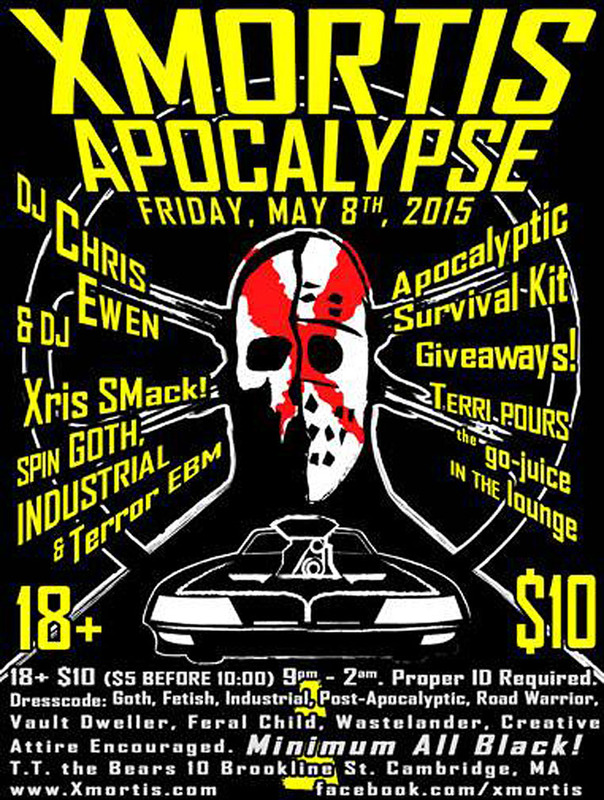 05/08/15 – XMORTIS: APOCALYPSE w/DJ Xris SMack! XMORTIS: APOCALYPSE w/DJ Xris SMack! DJ CHRIS EWEN & DJ XRIS SMACK! spin Goth, Industrial & Terror EBM! Terri pours the Go-Juice in the Lounge! Apocalyptic Survival Kit Giveaways for the Best Apocalyptic Outfits! 18+ $10 9pm - 2am. ($5 before 10:00*) Proper ID is Required for Entry! Goth, Fetish, Industrial, Cosplay, Post-Apocalyptic, Road Warrior, Vault Dweller, Feral Child, Wastelander, Creative Attire Encouraged. MINIMUM ALL BLACK!